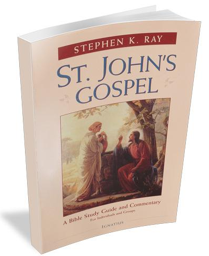 Topic: St. John and his Gospel. You can listen on-line at www.Catholic.com. For my book on John, click on the image to the right. All copies sent are signed. You can listen to the archived show here. For more listening and downloading options, click here. 1) Was John the closest to Jesus of all the gospel writers or apostes? 2) Why is John’s literary style and content so different and unique from the others? 3) Is it known where John died and where he was buried? Was he raised into heaven? 4) Why does John refer to the brothers of the Lord, especially James, if Mary had not other children? 5) When were the gospels written down and when did the oral tradition actually become written? 6) Why does the Coptic translation of John 1:1 say “a god” instead of just “the word was God”? 7) What interesting tidbits can you give me about the resurrection of Jesus from John’s gospel to share with my class next week? 8) What are your thoughts on the connection between John’s Gospel and the Book of Revelation? Who wrote Revelation?